Coccidiosis and histomoniasis are economically significant diseases in chickens and turkeys. Management, vaccination and medication are key tools in the control of these diseases but these tools are not without challenges. Work undertaken in both the laboratory and the field has looked at the impact of oregano-based (Orego-Stim) and carrier-based organic acid products on the prevalence of Eimeria infections or histomoniasis. Data indicate that Orego-Stim and/or organic acid presented in feed are able to positively influence bird performance during periods of exposure to Eimeria and, to a lesser extent, Histomonas. Early indications suggest these two types of additives might have an integral role in protozoal management programmes. 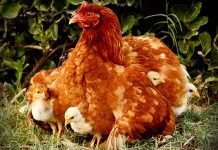 Eimeria and Histomonas are responsible for two of the main protozoal diseases that affect poultry: coccidiosis and Blackhead (histomoniasis). The economic impact of these diseases can be severe. For example, coccidiosis is estimated to cost the US poultry industry $127 million annually. 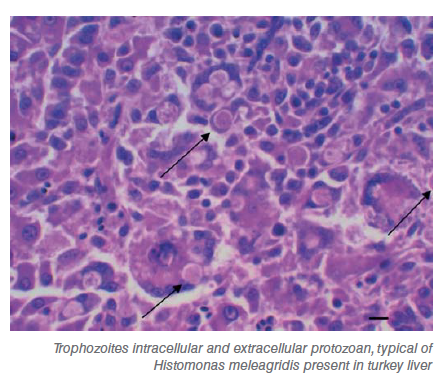 Turkeys appear to be more susceptible to Histomonas meleagridis than chickens, where if left untreated, it can cause mortality approaching 100%. There is also some suggestion that the virulence of Histomonas is affected by the presence of bacteria, notably Escherichia coli, Clostridium spp. and Bacillus subtilis, indicating, perhaps, a relationship with the gut, and particularly caecal, microbiota. 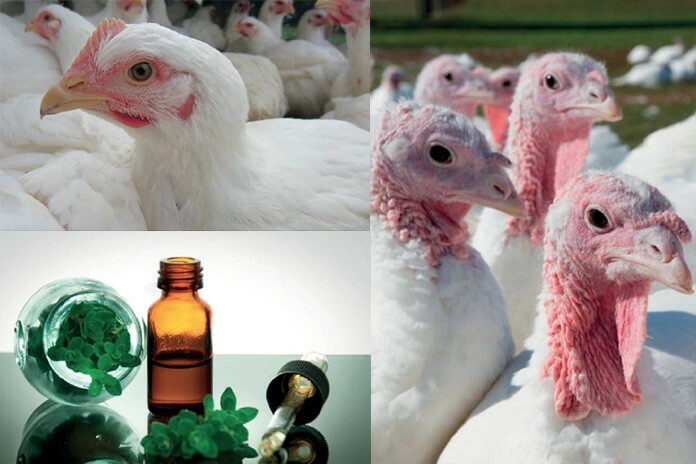 Antiprotozoal drugs and vaccines have long been used in commercial poultry production but there are no new compounds coming to market. 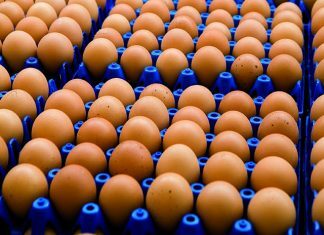 With the withdrawal of some existing products as well, the tools to help manage protozoal poultry infections are becoming limited. 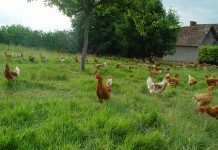 Feed additives, such as those based on organic acids or essential oils are increasingly used in poultry production as alternatives for antibiotics and to help manage gut microbiota. Can such products also help in the management of protozoal diseases, where gut health is known to be a significant factor? The use of oregano oil in laboratory infections with Eimeria has been well documented with promising results, although typically the studies are run in laboratory settings on clean litter systems. Recent work at Southern Poultry Research (Georgia, USA) demonstrated synergy between a commercial oregano-based product (Orego-Stim, OS) in feed and a commercial anticoccidial vaccine (Coccivac B52, Merck, USA). Birds were reared on re-used litter (to ensure a high natural bacterial and protozoal challenge) for 42 days and given a mixed Eimeria sp. (Eimeria acervulina, E. maxima and E. tenella) challenge at 21 days of age. 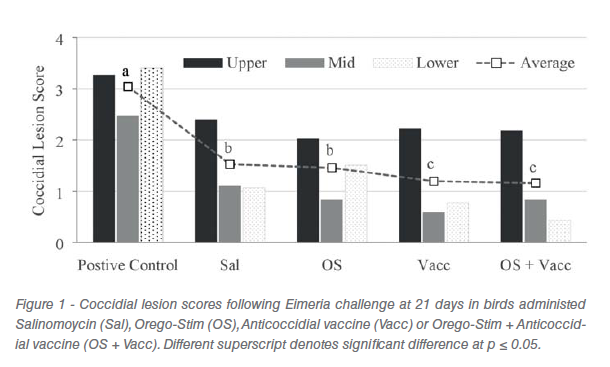 Where hatchery vaccination with a anticoccidial vaccine significantly adversely affected performance relative to a salinomycin (60 ppm) treatment (FCR: 1.87 and 1.64, Weight gain: 1.917 kg and 2.375 kg, respectively), the inclusion of OS at 150 g/T in feed was able to significantly ameliorate the vaccines negative performance impact (FCR: 1.73, Weight gain: 2.194 kg) without adversely impacting immune status to coccidial challenge (Figure 1). Indeed, OS (450 g/T) on its own delivered similar performance to salinomycin (FCR: 1.67, Weight gain: 2.412 kg). In a further study in Brazil on reused litter, the combination of a propionic/formic acid mixture on a silica carrier and OS was compared to birds on a standard antibiotic growth promotor/anticoccidial programme given both an Eimeria and bacterial challenge at 10 days. Preliminary data indicate a synergy between the acids and OS such that the acid/OS group performed numerically better than birds on the standard programme (FCR: 1.63, 1.57, Weight gain: 2.652 kg and 2.712 kg, respectively), and indeed better than either the OS or acid group separately, demonstrating a synergy between the acid and OS. Reports on the efficacy of natural feed additives for Histomonas control have been mixed at best. In a laboratory study, 4 out of 43 plant substance extracts demonstrated in vitro efficacy against Histomonas meleagridis but all failed to be protective when tested in-vivo. Similarly, several commercial products including a mixture of cinnamon and garlic, an aromabiotic, and an essential oil mixture were effective against H. meleagridis in vitro but again, not in vivo. Where natural feed additives have appeared to demonstrate some improvement in turkey performance following challenge with Histomonas, the challenge appeared to be subclinical in nature and did not cause mortality. Anecdotal evidence indicates that in field infections involving Histomonas that can only be resolved by drug treatment, OS in feed can help ameliorate the impact of the parasite. Typically, the concurrent supplementation of OS in the feed reduced mortality to single digits where mortality was 50-60% with nitarsone-only medication. Further laboratory work is underway to understand the interaction of oregano and Histomonas. Feed additives have an important role in managing gut health in poultry production. Laboratory and field experience support the potential of a commercial oregano-based product, Orego-Stim, alone or in combination with a carrier-based organic acid to have a significant role in protozoal (Eimeria and Histomonas) management programmes. More work is necessary to explore and understand their potential further. 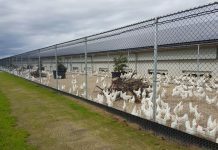 Previous articleHow to reduce antibiotics in broiler production?